In The Wounds of Nations: Horror Cinema, Historical Trauma and National Identity, UK lecturer Linnie Blake argues for the horror genre’s unique ability to confront the consequences of traumatic national events for individual and collective identities. Central to Blake’s study is an examination of the process of nation building, which typically has emphasised continuity, commonality and progress to the extent that internal conflict and resistance are suppressed. Blake considers this process – of “binding up the wounds wrought to such an image of nationhood by a means of ideologically expedient strategies and practices” (p. 8) – to be traumatic in itself. In order to deconstruct texts that resonate with the widest audience, The Wounds of Nations focuses exclusively on films that were either successful commercially or later acquired substantial cult followings. Overall, the book intends to examine how horror cinema’s generic codes are mobilised to “reopen” national wounds that have been denied, ignored, or only superficially addressed. In the introduction, Blake discusses the interpretive frameworks that inform her analysis of national horror cinemas. The relatively new area of Trauma Studies, with its multi-disciplinary emphasis on collective memory and the various ways that trauma is represented and overcome, provides the main theoretical underpinning for her arguments. Her work adopts Rick Altman’s structuralist conception of cinematic genres as constellations of the flexible interplay of aesthetic and formal interests, commercial strategies and critical reception (1). She also addresses postcolonial critiques of the nation-state combined with what she describes as a “broadly culturalist” approach that would take socio-economic and political factors into consideration to situate each film in a specific historical moment (p. 6). Of particular interest is how horror cinema disrupts notions of stable identities, liberating viewers from stifling narratives of nationhood and encouraging a productive and therapeutic encounter with trauma. For Japan, Blake explores the onryou subgenre, centred around the return of vengeful female spirits and made famous by the crossover success of Hideo Nakata’s Ringu (1998) and Gore Verbinski’s remake The Ring (2002), but originally adapted from ancient literature into post-war films Onibaba (Kaneto Shindô, 1964), Kwaidan (Masaki Kobayashi, 1964) and the lesser-known Kuroneko (Shindô, 1968). This chapter draws comparisons between both cinematic adaptations of Ring and the role of women in challenging homogenising constructions of national identity, while describing the larger trend of American remakes of Japanese horror films as a continuation of America’s need to define itself against a foreign “other”. Part two delves into the reverberations on the American psyche of the Vietnam War as the culmination of the most politically and socially turbulent decades, and the attendant backlash of the Reagan era’s conservative politics with its air of 1950s nostalgia. In the first section, Blake offers her view of the Living Dead series from much-discussed horror auteur George A. Romero, including more underappreciated films in his oeuvre such as Martin (1977) and The Crazies (1973). Romero’s formal proficiency in discrete horror tropes (contagion, supernatural and body horror) is utilised for portraying the various types of historical trauma suffered by Americans: the disintegration of the family, the rise of soulless consumer society and mass media, military aggression, racial strife and class inequality. The second section observes the nation’s collective retreat from radical politics to the Right, ushered in by the ascent of Ronald Reagan. His elegant rhetoric and comforting persona provided a salve to a nation, “whose confidence in Presidency had been shaken to its roots first by Watergate and Vietnam and then by the economic crises…” (p. 107). Suggesting that horror offers an alternate view of strong paternal figures, Blake views the popularity of cinematic slashers and serial killers in the horror franchises of the 1980s as embodying the values of the charismatic individual gone horribly wrong, in characters such as Hannibal Lecter and Freddy Krueger. In the briefest part of the book, part three, Blake offers a refreshingly original take on the resurgence and significance of “hillbilly horror” in post-9/11 American cinema. The remakes of The Hills Have Eyes (Wes Craven, 1977; Alexandre Aja, 2006), Two Thousand Maniacs! (Herschell Gordon Lewis, 1964) retitled as 2001 Maniacs (Tim Sullivan, 2005), and The Texas Chainsaw Massacre (Tobe Hooper, 1974; Marcus Nispel, 2003) are each set in the milieu of a backwoods America invisible to the mainstream and traumatised by decades of unemployment, poverty and the effects of militarisation. While the original versions of these films dealt with issues created by the Vietnam War, filmmakers of the current re-imaginings use the War on Terror in Afghanistan and Iraq, with its associated curtailing of civil liberties and demonisation of difference, to recontextualise the narratives. The figure of the “hillbilly” is simultaneously positioned as savage aggressor and victim of the nation’s attempt to marginalise aspects of society that refuse to be assimilated into dominant ideologies by primitively clinging to “extended kinship structures” and their own entirely local constructions of “history, tradition and class” (p. 147). Blake argues that as America undertakes a global mission to spread capitalism and democratic ideals, “hillbillies” serve as a powerful reminder of the failure in fully interpellating our own citizens into ideal national subjects. Finally, part four of the book focuses on the creative and popular resurrection of horror cinema in Britain, still grappling with the enduring political legacy of Margaret Thatcher. Of particular interest to Blake is how the new spate of films – Shaun of the Dead (Edgar Wright, 2004), Dog Soldiers (Neil Marshall, 2002), Reign of Fire (Rob Bowman, 2002) and 28 Days Later (Danny Boyle, 2002) – carve out a space for the fashioning of a new model of British masculine subjectivity. This subject position is cobbled together from the generic conventions of British realist cinema and the imperialist heroes of heritage dramas and adventure films, yet it is profoundly affected by the feminist and gay rights movements. Thus, New Labour party leader and Prime Minister Tony Blair, with his personal amalgamation of strong yet sensitive diplomacy, becomes a point of reference for deconstructing the male protagonists of these films. The Wounds of Nations is affected by the main problem of books that broadly survey many films: offering summaries which are not detailed enough for those who have not seen the films, yet tedious for those who have. However, The Wounds of Nations is an extremely useful entry in the fields of trauma studies, cultural studies and postcolonialism in the study of how diverse national cinemas and the horror genre negotiate social trauma. Although the book is clearly informed by, and bound to draw comparisons to, Adam Lowenstein’s exceptional Shocking Representations: Historical Trauma, National Cinema, and the Modern Horror Film (2), Blake makes her own contributions through her exclusive attention to popular and cult horror cinema. She convincingly envisions the horror genre as performing the ultimately therapeutic cultural work of destabilising homogenising narratives of nationhood and identity, to make way for a plurality of more inclusive subject positions. 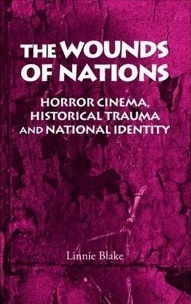 The Wounds of Nations: Horror Cinema, Historical Trauma and National Identity, by Linnie Blake, Manchester University Press, Manchester, 2008. Rick Altman, Film/Genre, British Film Institute, London, 1999. Adam Lowenstein, Shocking Representations: Historical Trauma, National Cinema, and the Modern Horror Film, Columbia University Press, New York, 2005. The Way We Were: Jerzy Skolimowski’s Hands Up! Robyn Citizen is a PhD candidate in Cinema Studies at New York University. In addition to horror cinema, her current research interest is the representation of race and ethnicity in Japanese and Korean cinema.